An in-depth book on the history of tapestry in Aubusson and Felletin by Robert Guinot, Editions Lucien Souny, 2009. In 2009 UNESCO designated Aubusson and Felletin to be a World Heritage Site. It is the only place in the world where for six centuries all the necessities for creating tapestries were met: the sheep, the spinning mill, the plants in the region and water from the Creuse River for dyeing,, les cartonniers (the cartoon artists) and the weavers, as well as the restoration facilities. Tapestry first came to Aubusson with the Arabs, in 732, where they sought refuge after their defeat in the Battle of Tours and subsequent expulsion from Poitiers. The next weavers to arrive were Flemish, who were expelled from Arras in the late 15th century by Louis XIth. Then, in 1664, King Henry XIV’s prime minister, Jean Baptiste Colbert designated Aubusson, and neighboring village of Felletin, as a Manufacture Royale, allocating patents for very strict control over the tapestry-making process: from the quality of the wool, the dyeing, to their unique weaving techniques. This strict control also meant carefully guarding their techniques in such a way that knowledge was passed down as an oral tradition through the generations within each family of tapestry weavers. Often, but not always, it was the men who wove. For Gisèle Glaudin-Brivet, fourth-generation maître-lissier. it was the women who wove in her family, originally from Felletin, France. In addition to having woven tapestries for noteworthy artists—including June Wayne, Picasso, and Jean Lurçat-- Gisèle collaborated with her husband, Henri Brivet, who taught tapestry design at the Aubusson École Nationale d’Art Décoratif (ENAD). Together they created smaller tapestries of scenes of Aubusson. No one in Gisèle and Henri Brivet’s family wanted to learn tapestry, so they decided to go against the centuries-old atelier tradition of never sharing tapestry secrets outside the family. In September of 1994 they welcomed me and two other weavers from the United States into their atelier to begin passing on some of their passion for tapestry, and their knowledge of cartoon-making and woven techniques. Indeed, here are the low-warp looms, which at that time I had seen only pictures of in historical tapestry books. To our left, one large loom spans nearly the entire length of the room. I see warp on the back beam, and the cartoon tray is piled with skeins of yarn and baskets of bobbins. Colors jumble together: yellows and oranges next to blues, purples, and reds. In my mind’s eye, I could picture ten, maybe 12, weavers sitting side-by-side on the loom bench, leaning forward as they work on a mural-sized tapestry. I turn as Gisèle moves to my right, to show me the looms we will be using. “This one,” she explains in French, “is over 400 years old. It sits lower and is more comfortable for shorter people, comme moi.” She grins, “This loom over here is better for those who are taller.” She looks directly at me. At this loom, my studies began. Time expanded and contracted during those weeks, where I ate, slept and lived totally immersed in tapestry, the French language and culture. When I was not weaving in Gisèle’s atelier, I spent weekends studying historical and contemporary tapestries in Aubusson, Felletin, La Chaise Dieu, Soreze, Angers, and Paris. Each Monday, I would return to Gisèle’s atelier and we would talk about what I had observed, before once again settling in to weave. When the day came to leave, I had absorbed into my cells so much, enough to know that I had barely scratched the surface of what more there was yet to learn. The next step would be in the “doing,” diving deeply into this gift of knowledge, and incorporating it into my work, continually pushing and stretching the possibilities. Many changes have happened in Aubusson in the 25 years since I last was there. Gisèle Brivet retired and closed her studio, as did at least a dozen other ateliers. The Aubusson École Nationale d’Art Décoratif (National School of Decorative Arts), otherwise known as (ENAD), also closed, to be re-purposed and remodeled. It reopened in July of 2016 as the new La Cité Internationale de la Tapisserie (International City of Tapestry Center). Its reference collection traces the history of six centuries of tapestry production in Aubusson, currently housing 330 wall tapestries, 15,000 graphic works, 4,000 handicraft implements. In addition, for the first time in nearly 20 years, it opened a training program for future maître-lissiers. Recently, Cresside Collette curated and wrote extensively about “Breaking Through Tradition – Contemporary Tapestry in France,” on the American Tapestry Alliance website. A treat to the eye to see the range of work in this on-line exhibit. I especially liked seeing les Nouvelles Verdures d’Aubusson (the New Greenery Tapestries) as a response to global warming, and was intrigued by Tapis-Porte (Tapestry Portal). New life, new breath in French tapestry, and in Aubusson, La Cité Internationale de la Tapisserie. **The terms, basse-lice and basse-lisse, both refer to the low warp, Aubusson tapestry loom. 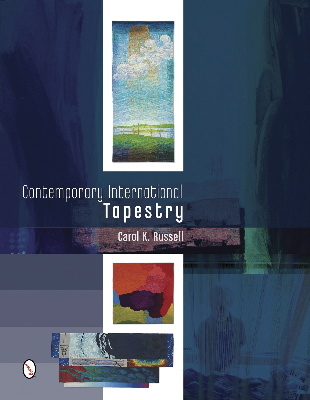 For further reading about my experiences in the atelier Gisèle Brivet, “Les Bons Gestes” article that I wrote for Tapestry Topics, newsletter of the American Tapestry Alliance. Thank you to Katherine Perkins for her article, “Aubusson: Une Ville Extraordinaire,” Tapestry Topics, Summer 2010, Vol. 36 No. 2, pp. 11-12. Thank you to Nancy Wohlenberg who scanned my photos into digital format.